Last month I completed the “inside staff” portion of my series on Georgian and Regency Era servants. Six separate blogs were necessary to cover everyone working inside the walls of a grand country manor house or upper-class London townhouse! I won’t need as many installments to detail the folks who labored outdoors, but this does not mean their jobs were less important. As will be revealed, the stable staff, gamekeepers, and groundsmen were equally vital to the upkeep and functioning of a great house, and for the prestige of the family dwelling within. If you missed the previous 6 installments or need a refresher, the links for each are listed below. The English did not invent the elaborate gardening landscape ideal but they brought their own style and techniques to the endeavor. In no other era was this truer than the Georgian. Classically imbued elegance and refined style: the earmarks and lasting accomplishments of the decades encompassing the shorter Regency. As in fashion, trends evolved and were inspired by other cultures, mainly European. In particular, French landscaping influences led to the formalized, highly symmetrical gardens popular during the 17th and 18th centuries. However, as the century turned and the war with France instilled strong sensations of patriotism, wealthy Englishmen rejected anything remotely French. Thus, the straight lines and sharp angles of geometric gardens were replaced (in parts) with the natural flow of curved pathways, rounded ponds, and freely growing vegetation. Suddenly the plethora of young men previously exposed to the untamed, extreme, and bold terrains prevalent in Europe while on their Grand Tour, as well as the varying garden and architectural styles of countries other than France, could allow their creativity to burst forth. As a result, the majority of the great estates during the Regency displayed a beautiful meshing of the two gardening styles that was unique from anywhere in the world. Travelers coming to visit would approach the main house via a circuitous route amid winding avenues planned so as to view the grounds advantageously. Passing through wooded areas, open fields with free roaming sheep or cattle or deer, rivers and lakes graced with elaborate fountains, until finally arriving at the house which was, of course, adorned with colorful flowers, lush bushes and trees, and precisely trimmed hedges. Hints of the superb hospitality, luxurious accommodations, and unparalleled entertainment to come. Trained through apprenticeships and decades of experience at multiple places, their knowledge would be comprehensive. A thorough understanding of indigenous and exotic plants, pruning, pest control, soil types, seasonal care, weed abatement, and the like was only the beginning. They also needed a firm grasp on the science and technology behind fountains and hot houses, for instance. They were educated on the historical precedence, cultural inspiration, and art of landscape beautifications, such as follies, mazes, statues, ha-has, and so on. Landscape design was a pure art form, and the men who rose in the field were artists on par with a master painter or musician. All of the groundsmen from the boss on down were far more than simple gardeners. There wasn’t a single chore from cutting the grass to erecting an elaborate structure to clearing the paths of debris that they weren’t responsible for and prodigiously skilled at. Above all, be assured that these men (and women) perfected their art with passion and loving care. Furthermore, they weren’t only in charge of the ornamental pleasure gardens but also the extensive herb and kitchen gardens, and fruit bearing trees required to feed the family and guests. Maintaining such elaborate and enormous gardens was an ongoing task that easily required up to 100 groundskeepers for a Pemberley-sized estate. Dozens more might be needed if garden construction was underway. Typically there was one Master Gardener who oversaw everything and consulted with the Master of the estate. Assistants would be assigned to manage specific areas — the orangery, kitchen gardens, ornamental gardens, orchards, and so on — with a crew of apprentices and laborers under their command. “Forcing Garden in Winter” from Fragments on the Theory and Practice of Landscape Gardening by Humphry Repton, 1816. British artist John S. Goodall (1908-1996) illustration of Regency gardeners at work. Truth is, I have searched a number of times for specific information on who took care of the upkeep and repairs to the house itself. Logic dictates there had to be a passel of workers who did nothing but fix broken tiles, clean the brick walls, repair cracked window panes, patch leaky roofs, repaint the trim, empty the gutters, sweep the terrace, remove mold and moss from the statues, and so on. Yet, I’ve found nothing to indicate a special branch of servants with a unique title, so have concluded Georgian handymen fell under the broad “groundskeeper” umbrella. What became certain as I Googled the topic is that the decline in stature of the great houses (many of which closed during and after the World Wars), and ultimately led to the creation of the British National Trust to restore and preserve, was primarily due to the decay of the house itself. Vegetation survives without constant attendance, albeit in a less attractive state, but bricks and mortar crumble if left alone. Maintenance of the structure was increasingly difficult due to changes in the servant class and men needed on the battlefield, and even with the advantages of modern technology costs escalated. “A conservative estimate of the annual cost of maintaining an historic house is 2 per cent of its value,” says George Burnard, of Strutt & Parker’s country house department. So Mr Blair would spend about £600,000 on Winslow Hall each year. This American has no idea what the US dollar value of £600,000 is, but any currency with that many zeros is bound to be a huge number! And granted we are talking 2007 versus the 1810s. Still, any way you slice it, we are talking a hefty sum. Additionally, in an era before power tools and a nearby home improvement superstore, the amount of work is mindboggling. Pesticides as we know of them did not exist, although various chemicals such as sulfur, mercury, arsenic, and nicotine were utilized. “Necessary Instruments for Gardening” from Le Jardinier Solitaire by Francois Gentil, 1706. No electricity, no water pumped via long hoses, and no gas powered riding mowers. Yes, gardening was rough physical labor in these bygone days. However, what they did have was a wealth of tools for every need! According to famed gardener John Evelyn (1620–1706) who wrote Elysium Britannicum, or The Royal Gardens in Three Books, one list of “absolutely necessary” gardening tools included: iron-clad spades, rakes, hoes, pickaxe and shovel, sieves and screens, dibbers, transplanter, a planting lattice, ladder, trowels, turf lifter, turf edger, scyther, slasher, stone roller, leveller, tamper, funnel, shears, and long pruners. And that was just his first list! Perhaps the toughest task was keeping the extensive lawns cut. Grazing sheep and cattle represented the first lines of defense. And here you thought they were there to look pretty! Well, in part that is true, the appearance of roaming wildlife fitting in with the natural aesthetic desired. Primarily they were useful in managing plant and grass growth, although grazing animals rarely nibble in perfectly neat rows. Furthermore, the downside of turf gouged by sharp hooves and animal droppings, while “natural”, might mar the pristine visual! Another reason meticulous planning of the landscape was essential. Animal herds do the trick, as long as they stay in distant meadows! Sheep grazing at Highclere Castle. Gardens designed by Capability Brown. So what about cutting the lawns designated for strolling or gaming fields? As the drawing below left reveals, coordinated teams of laborers wielded scythes to clip the grass, using a smooth, well-rehearsed motion to cover large areas of ground. This would be done at least weekly during the spring to autumn months. Mowing clover, late-19th century by Arthur Verey. Drawing of family using scythe and shears. 1817 illustration of farmer sharpening a scythe. 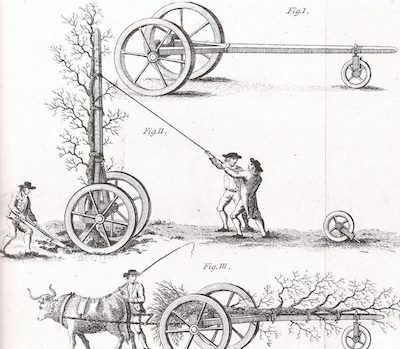 1794 drawing of groundsmen moving a big tree. The first lawn mower was invented by English engineer Edwin Beard Budding in 1827 after he noticed a machine with revolving blades on a cylinder that was used in textile mills to shear the nap of velvet. I shall return next month for the second installment in my Regency Servants series dedicated to the outside staff. a post on the popular Regency Era landscape features. Wonder what a folly or ha-ha is? Curious how an orangery functioned? I have the answers, and more! From reading elsewhere, mostly Georgian era farming books with boring expenditure accounts of who they hired to do what … basic cleaning and maintaining was the domain of whoever worked in that area, just as a modern farmer fixes the saggy gate to his corrals. So the gardeners would be keeping moss off statues, raking leaves out of fountains, cleaning the gutters, and the stable staff doing small barn repairs (or the owner griping they didn’t do them), the dairyman and dairymaids keeping up the dairy. I imagine that a butler or footman who was “handy” would be fixing minor things on the inside. Large estates had a carpenter or even several of them who did everything from rehang a sticky door to make a coffin or a cottage. They had their own work room, maybe even a building called the “joinery”. Often a village would have a glazier and lock fixer or other specialist craftsman who worked around the area because no estate had the need to keep on one full time. Itinerant craftsmen – knife sharpeners, tinkers, glaziers, also made the rounds in rural areas. In a larger town you would send the footman for the desired craftsman, usually from the butler’s list of reliable workers. Major estate projects – replacing lead roofs, repointing brick walls, rethatching cottage roofs, etc. were done by professionals hired by the steward. The complaints from stewards about insufficient funds from the owner to do repairs are neck and neck with the complaints by new heirs about stewards for not taking care of the estate despite ample funding, or spending all the profits on fixing cottages for the ingrate peasants. Stewards also oversaw or hired the forestry men – the ones who cut and hauled timber, replanted trees to replace the ones they cut, pruned up the growing trees to endure best growth. Hedging and the care of them was usually hired out as a speciality. Thaqnk you so much for the info on country estates. I never could seem to find a map or anything that showed the layout of house and grounds. Thanks for another fascinating post! It’s like the Sharon Lathan University! This is amazing research you’ve done! It’s generous of you to share – I especially loved all the images! Wonderful post, as always, Sharon! Thanks for teaching us SO much!! I have so enjoyed this post, such detail, beautiful pictures and sketches. Thank you for all your hard work and research. I have thoroughly enjoyed your blogs on the servants needed to make those great homes and estates work and function…amazing.